In this paper, an air conditioner has been constructed using peltier thermoelectric module which is attractive for upcoming technologies. Thermoelectric modules are widely used in product areas such as from simple coolers to temperature control systems in military and telecommunications organizations. Here, the construction of an air conditioner using peltier thermoelectric module has been presented. MLA M. Divya, K. Saravanan, R. Poorani and T. Ravichandran. "Development of Non-Refrigerant Air Conditioner using Peltier Thermoelectric Module." International Journal for Innovative Research in Science & Technology 4.10 (2018) : 1-6. APA M. Divya, K. Saravanan, R. Poorani and T. Ravichandran. (2018). Development of Non-Refrigerant Air Conditioner using Peltier Thermoelectric Module. International Journal for Innovative Research in Science & Technology, 4(10), 1-6. Chicago M. Divya, K. Saravanan, R. Poorani and T. Ravichandran. "Development of Non-Refrigerant Air Conditioner using Peltier Thermoelectric Module." International Journal for Innovative Research in Science & Technology 4, no. 10 (2018) : 1-6. E-governance is the latest trend in many countries in which the government system is being online to deliver the government services to the citizens. The services can be from Government to Citizen (G2C) and Government to Business (G2B) or Government to Government (G2G) or Government to Employee (G2E) or vice a versa. People can access any application or any scheme from anywhere, anytime. As it comes with the word online, the biggest concern is the security issue. To provide E-authentication to the user there are many cryptographic techniques available. This paper discusses to increase the security, reliability, and non-repudiation of the userâ€™s data or information using Digital signature. It is highly secured and well-known method to authenticate and verify an electronic transaction. MLA Vishal R. Pancholi, Dr. Bhadresh P. Patel and Dr. Dilendra Hiran. "A Study on Importance of Digital Signature for E-Governance Schemes." International Journal for Innovative Research in Science & Technology 4.10 (2018) : 7-10. APA Vishal R. Pancholi, Dr. Bhadresh P. Patel and Dr. Dilendra Hiran. (2018). A Study on Importance of Digital Signature for E-Governance Schemes. International Journal for Innovative Research in Science & Technology, 4(10), 7-10. Chicago Vishal R. Pancholi, Dr. Bhadresh P. Patel and Dr. Dilendra Hiran. "A Study on Importance of Digital Signature for E-Governance Schemes." International Journal for Innovative Research in Science & Technology 4, no. 10 (2018) : 7-10. Cancer is a malignant disease that has caused millions of human deaths. Text mining can help researchers discover hidden rules and relationships between documents so advanced cancer research. In this paper, we analyze the properties of text mining and cancer research documents. We discussed the research directions of text mining in cancer research with examples of systems and tools. In conclusion part, we talked about future way the text mining development. MLA B. Meena Preethi, R. Sruthi and R. Darshna. "Text Mining Used in the Field of Cancer Detection." International Journal for Innovative Research in Science & Technology 4.10 (2018) : 11-15. APA B. Meena Preethi, R. Sruthi and R. Darshna. (2018). Text Mining Used in the Field of Cancer Detection. International Journal for Innovative Research in Science & Technology, 4(10), 11-15. Chicago B. Meena Preethi, R. Sruthi and R. Darshna. "Text Mining Used in the Field of Cancer Detection." International Journal for Innovative Research in Science & Technology 4, no. 10 (2018) : 11-15. In Mobile Ad hoc Network (MANET) all the nodes are mobile in nature, Because of the dynamic behaviour of network link are not maintained for long time. Our Work is towards a new performance based Throughput, PDR, End to End delay scheme with AOMDV protocol. In this scheme nodes are do routing with AOMDV protocol by using shortest path. Nodes in network are in some time not free then at that time here communication is lost, so using routing table we could know about which number of nodes are available or not. Using table we have time to time information about each node. Using AOMDV protocol I have to try achieve high performance with comparing to AOMDV. MLA Hinal Makwana and Prof. Hitesh Patel. "Advancement in Performance of Wireless AdHoc Network using AOMDV in MANET." International Journal for Innovative Research in Science & Technology 4.10 (2018) : 16-20. APA Hinal Makwana and Prof. Hitesh Patel. (2018). Advancement in Performance of Wireless AdHoc Network using AOMDV in MANET. International Journal for Innovative Research in Science & Technology, 4(10), 16-20. Chicago Hinal Makwana and Prof. Hitesh Patel. "Advancement in Performance of Wireless AdHoc Network using AOMDV in MANET." International Journal for Innovative Research in Science & Technology 4, no. 10 (2018) : 16-20. It is unlucky, but many medium and large scale manufacturing industries in South India donâ€™t take improvement of the financial prospect that scrap material from their manufacturing process presents. They think of this material as a â€œcrucial sinâ€ of their business without accepting the benefits and protection that a proficient scrap management program can provide. Usually, scraps can create a great deal of further revenue for their industry. In addition, Manufacturers won`t gives attention to scraps because they don`t tolerably track and control the scrap they are selling. This study focuses on to give future optimization solution that helps in managing scraps effectively and with profitability in medium and large scale manufacturing industries. MLA Dr. G. Balamurugan and S. M. Prabhakaran. "Future Optimization Solution for Managing Scraps in Medium & Large Scale Manufacturing Industries." International Journal for Innovative Research in Science & Technology 4.10 (2018) : 21-24. APA Dr. G. Balamurugan and S. M. Prabhakaran. (2018). Future Optimization Solution for Managing Scraps in Medium & Large Scale Manufacturing Industries. International Journal for Innovative Research in Science & Technology, 4(10), 21-24. Chicago Dr. G. Balamurugan and S. M. Prabhakaran. "Future Optimization Solution for Managing Scraps in Medium & Large Scale Manufacturing Industries." International Journal for Innovative Research in Science & Technology 4, no. 10 (2018) : 21-24. The study is to investigate the relationship between emotional intelligence and work attitude of employees in hospitals. Emotional intelligence reflects the ability to read and understand others in social contexts, to detect the emotional reactions and to utilize such knowledge to influence others through emotional intelligence and control. A descriptive study has been made on various online journals, articles and textbooks. The literature review reveals that emotionally intelligent people have an awareness of situations pertaining to themselves and beyond their own personal perspectives. Results of the study strongly support that certain positive attitudes help employees to perceive organizational justice, to have more satisfaction, more commitment and to cope with stress and challenges at work. MLA Dr. G. Balamurugan and G. Nivetha. "A Study on Emotional Intelligence and Employeeâ€™s Work Attitude in Hospitals." International Journal for Innovative Research in Science & Technology 4.10 (2018) : 25-27. APA Dr. G. Balamurugan and G. Nivetha. (2018). A Study on Emotional Intelligence and Employeeâ€™s Work Attitude in Hospitals. International Journal for Innovative Research in Science & Technology, 4(10), 25-27. Chicago Dr. G. Balamurugan and G. Nivetha. "A Study on Emotional Intelligence and Employeeâ€™s Work Attitude in Hospitals." International Journal for Innovative Research in Science & Technology 4, no. 10 (2018) : 25-27. Demand for construction aggregates in India amounted to 1.1 billion metric tons in 2006, making the country the third biggest aggregates market in the Asia/Pacific region and fourth largest market in the world (after China, the US and Japan). Sales in India have risen an average of 7.7 percent annually over the past ten years, exceeding both regional and global averages. A rapidly advancing economy and rising standards of living have helped increase overseas investment in India, stimulating large amounts of industrialization and infrastructure-related construction activity. However, Indian product demand (relative to construction spending and on a per capita basis) is substantially below regional and world averages. The most commonly used product type is crushed stone, making up 40 percent of total 2006 aggregates demand. Gravel accounts for the next largest share of demand, followed by sand and other aggregate materials. Construction aggregates demand in India is expected to rise at a 7.7 percent annual pace to 1.6 billion metric tons in 2011, a deceleration from the 2001-2006 periods. Ongoing industrialization and government plans to expand and upgrade the country's physical infrastructure will fuel market growth. This paper shows use of demolish concrete as aggregate in cement concrete. MLA Veena Mandlekar and Sandeep Gupta. "Review of Utilization of Demolish Coarse Aggregate in Cement Concrete." International Journal for Innovative Research in Science & Technology 4.10 (2018) : 28-32. APA Veena Mandlekar and Sandeep Gupta. (2018). Review of Utilization of Demolish Coarse Aggregate in Cement Concrete. 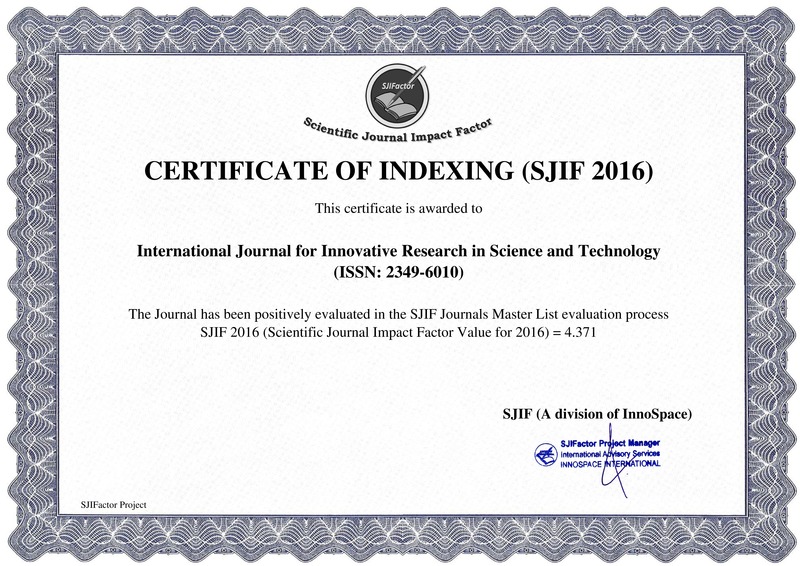 International Journal for Innovative Research in Science & Technology, 4(10), 28-32. Chicago Veena Mandlekar and Sandeep Gupta. "Review of Utilization of Demolish Coarse Aggregate in Cement Concrete." International Journal for Innovative Research in Science & Technology 4, no. 10 (2018) : 28-32. Providing proper security for MANETs with devices that can configure themselves without a strict intervention by network administrators is a challenging task. Due to its dynamic network topology and decentralized administration, AODV routing protocol in MANET is more susceptible to various attacks like Black Hole and Gray Hole, where a malicious node drops the packets it receives on purpose. This paper lists out and provides information about different techniques proposed by researchers to detect and/or mitigate black hole attack for AODV. The paper concludes with a summary of the techniques and the possibilities of future enhancements that can be done on one or more of the techniques mentioned. MLA Hardik N. Talsania and Zishan Noorani. "A Survey on Techniques to Handle Black Hole Attack for AODV in MANET." International Journal for Innovative Research in Science & Technology 4.10 (2018) : 33-37. APA Hardik N. Talsania and Zishan Noorani. (2018). A Survey on Techniques to Handle Black Hole Attack for AODV in MANET. International Journal for Innovative Research in Science & Technology, 4(10), 33-37. Chicago Hardik N. Talsania and Zishan Noorani. "A Survey on Techniques to Handle Black Hole Attack for AODV in MANET." International Journal for Innovative Research in Science & Technology 4, no. 10 (2018) : 33-37. Now the world is moving digitalized. To bring enhancement in modern world, we are ongoing on in a new concept known as the big data. Almost eighty to ninety percent of businesses that are running today seek a new and better approach to remain competitive and profitable. To do this, big data leads them in a path that stays ahead of the curves. Thus big data is an approach that helps people to make their life more comfortable, profitable and compatible one. Big data plays a major role in planning important strategic and operational plans and implement them. Apart from business people also use big data for many other reasons. Many people browse, collaborate, and shop for goods and services online, big data gives them hand to perform all these tasks. Not only consumerâ€™s even business to business transaction takes place in this platform. This paper totally discusses about big data analysis, its history, various definitions, background and finally its applications. The platform which helps people in almost all means of their livelihood and makes their life comfortable is considered to be the best one. In such consideration big data is one of the best one in all means. MLA Jeevitha I, Giri Pai U and Mohana Prasath S. "An Overview on Big Data Analysis." International Journal for Innovative Research in Science & Technology 4.10 (2018) : 38-43. APA Jeevitha I, Giri Pai U and Mohana Prasath S. (2018). An Overview on Big Data Analysis. International Journal for Innovative Research in Science & Technology, 4(10), 38-43. Chicago Jeevitha I, Giri Pai U and Mohana Prasath S. "An Overview on Big Data Analysis." International Journal for Innovative Research in Science & Technology 4, no. 10 (2018) : 38-43. Fossils fuels will be the main fuels for the thermal power there is a fear that they will get exhausted eventually in next century therefore many countries are trying systems based on non-conventional and renewable sources. Fuzzy logic control is proposed for windmill generators to reduce the total harmonic distortion present in the conventional method which uses PI controller. PI controller is used only for linear loads. The proposed system consists of a doubly fed induction generator based variable speed wind energy conversion systems (WECS) consisting two back to back inverters with a common dc link. The gate pulses for the two converters are controlled by fyzzy logic controller. The generator side inverter controls its speed to extract maximum power at different speeds, while the grid side inverter delivers the renewable power to the power to the grid with 3P4W nonlinear load compensation simultaneously. Moreover, in the proposed system, the grid side inverter is also utilized as a harmonic, a reactive power, and unbalanced load compensator for 3P4W nonlinear load. This enables grid to always supply /absorb a balanced set of fundamental currents at unit power factor. The effectiveness of the proposed scheme is developed and simulated using MATLAB/ Sim Power System software. MLA C. Ebbie Selva Kumar, J. Jasper and R. Eveline Pregitha. "Fuzzy Logic Controller Based Power Quality Improvement of Doubly Fed Induction Generator Wind Energy Conversion System." International Journal for Innovative Research in Science & Technology 4.10 (2018) : 44-52. APA C. Ebbie Selva Kumar, J. Jasper and R. Eveline Pregitha. (2018). Fuzzy Logic Controller Based Power Quality Improvement of Doubly Fed Induction Generator Wind Energy Conversion System. International Journal for Innovative Research in Science & Technology, 4(10), 44-52. Chicago C. Ebbie Selva Kumar, J. Jasper and R. Eveline Pregitha. "Fuzzy Logic Controller Based Power Quality Improvement of Doubly Fed Induction Generator Wind Energy Conversion System." International Journal for Innovative Research in Science & Technology 4, no. 10 (2018) : 44-52.